Epic really isn't messing around with the free games. Reality-bending teen drama Oxenfree is the latest game to temporarily shed its price on the Epic Games Store, and you can grab it between now and April 4. 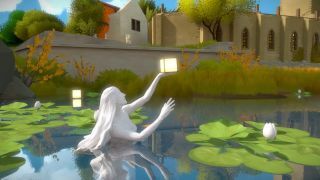 It will quickly be followed by Jonathan Blow's idyllic puzzler, The Witness. Oxenfree's a cracking adventure, and if you've somehow slept on it up until now, get it and pencil in an afternoon to explore a creepy island with your friends and frenemies. Check out Andy's Oxenfree review. I've already got Oxenfree, but I never got around to picking up The Witness, despite my penchant for puzzles, so I'll be setting aside some time for that next month. It's a good 'un, by all accounts, including our own Witness review. So far, the freebies have been great. I can't believe I missed out on Slime Rancher when it launched, but I've been having a superb time kidnapping little slimes and harvesting their precious poo. After 33 years, I've finally found something I'm good at, if you ignore a few escape attempts.